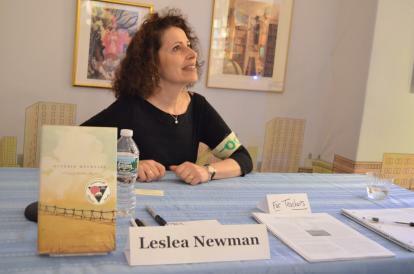 Lesléa Newman shot to fame in 1989–her groundbreaking children’s book “Heather Has Two Mommies,” with its warm and loving depiction of a child and her lesbian parents, was celebrated in some circles and banned in others. In the ensuing years, she has written or edited more than 60 books, including “A Letter to Harvey Milk,” “The Boy Who Cried Fabulous,” “The Reluctant Daughter,” “Nobody’s Mother,” and “Write from the Heart.” Her recent book “October Mourning: A Song for Matthew Shepard” (Candlewick Press) is a moving and evocative response to Shepard’s death, and was almost 14 years in the making. “October Mourning: A Song for Matthew Shepard” has been recommended by many teachers and children’s library groups, and has won several young adult book awards. This is not a typical choice of literature for children or young adults. Can you say more about this? Posted July 24th, 2013 & filed under Interviews.